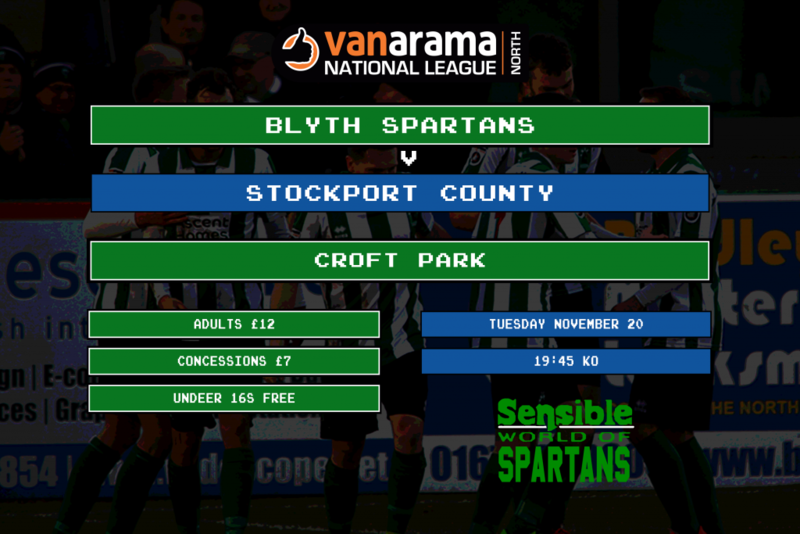 After picking up a vital three points in come-from-behind victory over Curzon Ashton on Saturday afternoon, Spartans face a stern test in the form of former Football League side Stockport County – a former stomping ground for Blyth’s manager Alun Armstrong. Blyth currently reside in 16th in the Vanarama National League North table with 20 points from 17 games. Saturday’s result leaves Spartans just two points away from the top half and four points behind today’s visitors. However, Blyth are just three points above the relegation zone despite the upturn in recent form. Stockport County are 10th in the Vanarama National League North having played 16 games. They’ve won six, drawn 6 and lost four so far this season. Those four defeats came in the opening nine games of the season, and the Hatters are currently on a 12-game unbeaten run in all competitions, with Jim Gannon’s side advancing to the Second Round of the FA Cup after a 3-1 win away at Yeovil Town. Tuesday will be the eighth meeting between the two sides, the clubs having met five times in the FA Cup before the 2017/18 National League North meetings. In November 1934 the sides met twice. After seeing off North Shields in the fourth qualifying round, Spartans drew the Hatters in the First Round and secured a replay with a 1-1, losing the replay 4-1 away from home. In 1958/59 the sides met in the second round at Croft Park when the visitors won by the odd-goal in seven, a thrilling 4-3 result. In 71/72 the side once again in the second round, again at Croft Park – this time Spartans the victors 1-0. A final FA Cup meeting came in 1995/96, again in the Second Round this time at Edgeley Park – The Hatters running out 2-0 winners. Last season was the first time the sides had met in league competition, and Spartans left it late at Edgeley Park as Michael Liddle and Jarrett Rivers netted late to secure a famous victory. The return leg saw Stockport gains some revenge, winning 1-0 late in the season at Croft Park after a battling Spartans performance. Jim Gannon started and finished his career as a player in Ireland, but made most of his professional appearances in the English Football League at Stockport County, where supporters elected him as a member of the Hall of Fame. Gannon began his playing career at Dundalk, but moved to English club Sheffield United in 1989. The next year he transferred to Stockport County, following a short loan spell with Halifax Town. He spent the next ten years at Stockport, becoming one of the club’s most loyal servants, and helped the club to second-place finishes in both the Second Division and Fourth Division, as well as two League Trophy finals. After leaving the club in 2000, he spent a season with Crewe Alexandra, before returning to Ireland with Shelbourne, winning two League of Ireland Premier Division titles in his three years there. Starting a career in management, he took charge of his first club Dundalk in 2004. After a season in Ireland he returned to Stockport County as manager. There he led the club to promotion from League Two via the play-offs in 2008. Leading County to safety in League One despite a ten-point deduction for entering administration, he lost his job as part of a cost-cutting measure. Heading to Scottish Premier League side Motherwell, he managed the club in the Europa League, but left after just 25 games in charge. He took charge of Championship side Peterborough United in 2010, but stayed at the struggling club for only two months, turning down a four-year contract. In January 2011 he was appointed manager of Port Vale, but lasted just ten weeks in the job. He returned to Stockport in November 2011, as the club’s director of football and manager, before being sacked in January 2013. He took charge at Northwich Victoria in December 2013. He spent just over two years with Northwich before returning to manage Stockport County for the third time in January 2016. Prolific, highly-rated attacker Matty joined the Hatters in May 2017 after scoring 13 goals in just 16 appearances for Curzon Ashton in the National League North. Matty has also scored goals for Maine Road and Salford City and can play as a centre forward or as a ‘Number 10’. Last season he scored 21 goals in 45 appearances to help fire County into the end-of-season Play Offs. He has six goals this season including a hat-trick against high-flying Chorley. Jamie Holmes and Alex Nicholson are back in contention after missing the last few games, while Nathan Buddle continues to sit out due to a concussion. Robert Dale is three goals away from 200 for Blyth Spartans. Damen Mullen is now four games away from 200 for Blyth Spartans. Peter Jameson and Sean Reid are the only two players to have played in all 21 games this season.